The purpose of the NOIT™ unit is to support an individual with autism who lacks the receptive language skills needed to follow verbal instructions to learn how to be in a state of orientation with the senses working in harmony. Q. There is no mention of a cure for autism. Shouldn’t the purpose be to cure autism? A. Autism isn’t a disease and it cannot be cured. However, individuals with autism can be assisted to harmonize the sensory input they perceive which will help them to learn techniques to strengthen areas of weakness. Q. If the NOIT doesn’t cure autism what does it do? A. Its function is to support an individual while they learn to establish a stable orientation. It cannot cause this directly, but by putting an auditory stimulus in the exact same place at frequent intervals (every eight seconds) for long periods of time, the person learns to keep their attention in one place. By keeping their attention in one place, they are able to accurately perceive the world around them from this place. When they can do this, we say that the person is “oriented”. Once the person can create and maintain an oriented condition, very quickly all of their perceptions will be functioning in harmony. This in turn removes the chaos from the environment and allows the person to function from a single perspective. Q. About the unit itself, what does NOIT mean? 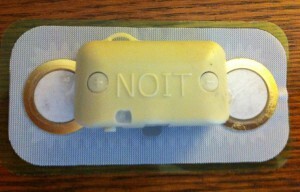 A. NOIT is an acronym for Natural Orientation Inducing Tool. Q. So, what is a NOIT and how does it work? First, an electronic circuit board with a rechargeable battery. Second, are two converse piezo elements. And third, a sticky Gel-Pad. It works by way of the circuit board generating an electronic impulse and sending it to the piezo elements. The impulse stimulates the piezo elements to vibrate at a specific frequency of 4.0/4.6 kilohertz. The vibrating piezo elements make an audible sound that is heard behind the head, slightly above the line of sight. This place in space is called an “orientation point”. The sticky Gel Pad simply allows us to attach the unit to the person for ease of use. Q. What is the significance of orientation? A. For whatever reason, individuals with non-verbal autism didn’t create their own natural orientation. Because it didn’t fully occur, the individual is left unable to control their perception of the environment.The result is that the individual lives in a constant state of sensory overload or devises strategies to manage this overload themselves. This gives rise to many of the common characteristics we see in non-verbal autistic individuals. By learning to achieve an oriented state, they are able to perceive their environment much like the rest of us. This naturally leads to a lessening of behaviors characteristic of autism and allows the individual to spend more time learning how to interact appropriately. Q. How big is the unit? A. The gel pad is 2”x 4”. 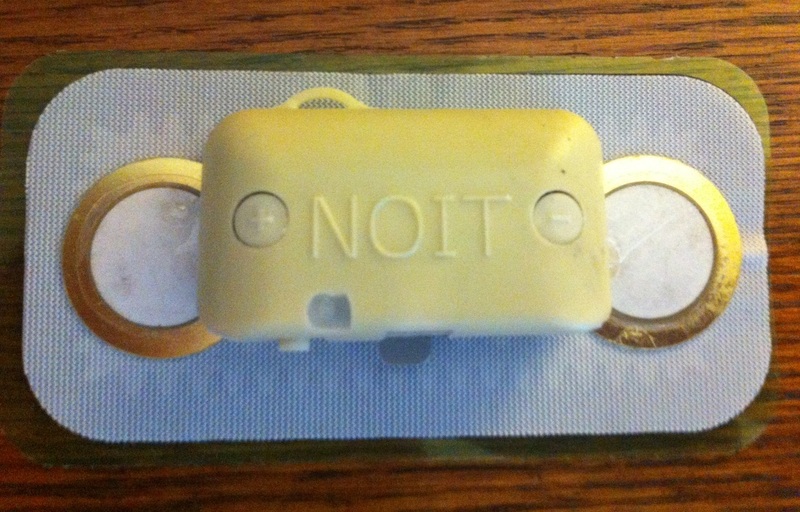 The NOIT itself is 1.5” square and about 1/2” thick. Q. Where is the device worn? A. On the back just below the collar line. Q. What can be expected from using the NOIT. A. Families of children who have used the NOIT unit have reported the following changes: less repetitive or ritualistic behaviors, less self-injury, improved focus and attention, improved social interaction, and improved language skills. Q. Who can use a NOIT. A. Currently, only individuals that are recommended by a Davis Facilitator. A trained facilitator must monitor the use of the unit. Most families choose to follow up with their facilitator and complete the full Davis Autism Approach Program.